Leslierahye has gathered up another group of creative peeps to do a little blog hop for you, and I'm happy to take part! 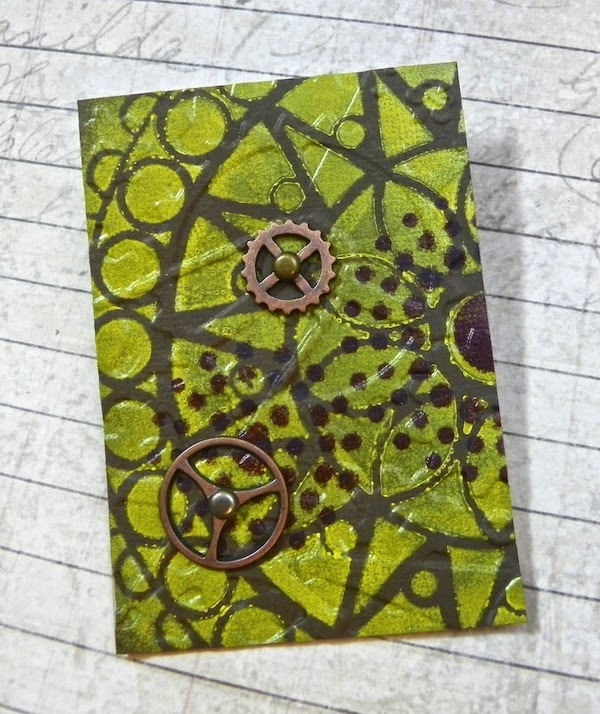 I enjoy steampunk, but I must say I'm not much into the typical springy thingies...so the closest I'm coming to the spring theme with this little artist trading card is the flower-ish stencil and the yellow and purple paints...tempered by brown cardstock of course, lol. I used one of Rebekah Meier's new stencils called Stained Glass, and I added a little spotty sunburst stencil on top. I embossed the card with the Spellbinders Creative Cogs embossing folder. Check out the rest of the blog hop below - enjoy! Rebekah Meier's stencils for Crafter's Workshop - a blog hop and a giveaway! So I'm sure you can tell by my logo that I loves me some circles...you could say I'm circle happy. Rebekah Meier's new mandala-style stencils for Crafter's Workshop make me even circle-happier! I decided to use her Rosette stencil to paint an art journal page. I used a cosmetic sponge with Liquitex Glossies paints (for non-porous surfaces) on translucent vellum paper. I added an inspiring John Lennon lyric on top with a strip of Craft Attitude film and backed the page with white cardstock. I sandwiched a ring of blue cardstock in between to give a little contrast and it makes the white in the center pop more. I was extra inspired to paint this page after going to Daniel Kanaan's open studio this past weekend. I really like his work with circles...so simple yet so strong. A circle carries so many different meanings. Be sure to check out what all the other designers in this hop did with Rebekah's stencils - fabulous stuff - just click through the links below. We do love supporting our friends' product launches - wheee! Word mosaic with Craft Attitude and Smoothfoam - plus a giveaway! You may already have Volume 1 of this book, but you really do need Volume 2, too! The New Ultimate Guide to the Perfect Word is filled with inspiring quotes, words and prompts to use in your craft projects. I was flipping through the book the other day, trying to decide what to make for my webcast. I saw a passage that said "words become art" and that's what made me think of creating a word mosaic plaque, using Smoothfoam and Craft Attitude Printable Film. There are word mosaic apps out there to do the job, but I decided to just use Powerpoint to arrange several words together related to painting. My video and tutorial is below - and if you leave a comment here on the blog, you'll be entered to win your own copy of this wonderful book (US only - sorry to our international friends). A sheet of Smoothfoam makes a great surface for a lightweight plaque, plus I wanted a white background for the word mosaic. I also really like how the film just melts right into the texture of the foam. 1. Blend a little paint with medium and brush the Smoothfoam with one coat; let dry. 2. Print your image out, in reverse, on to Craft Attitude film; trim to size. 3. Cover the Smoothfoam surface with glue stick. Peel back a little of the paper liner, position the film and press into place. Smooth the film on to the glued surface as you continue to peel away the liner. 4. Distress the edges with an ink pad and smudge the color with a damp paper towel. Glue a narrow ribbon around the edge of the image. 5. 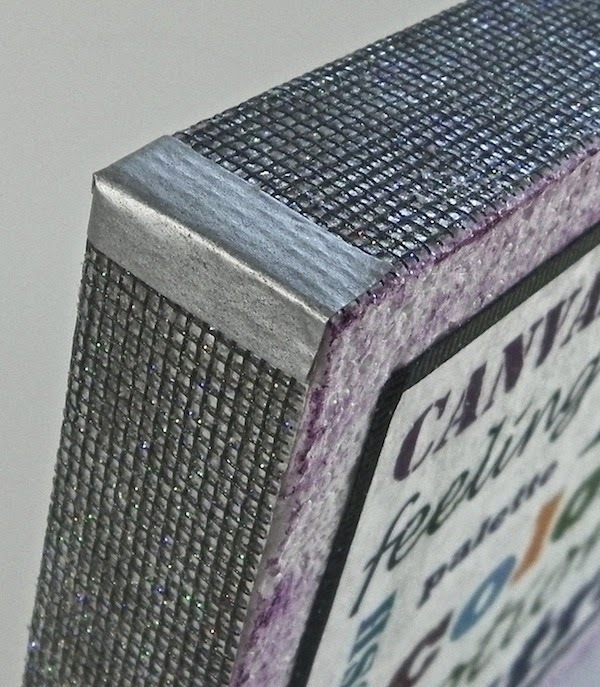 To make a frame, layer and glue the screen tape on top of the aluminum tape, then sprinkle lightly with clear glitter. 6. Adhere the tape around the edges of the Smoothfoam, wrapping excess to the back. Add a small strip of aluminum tape to the corners like a brace. 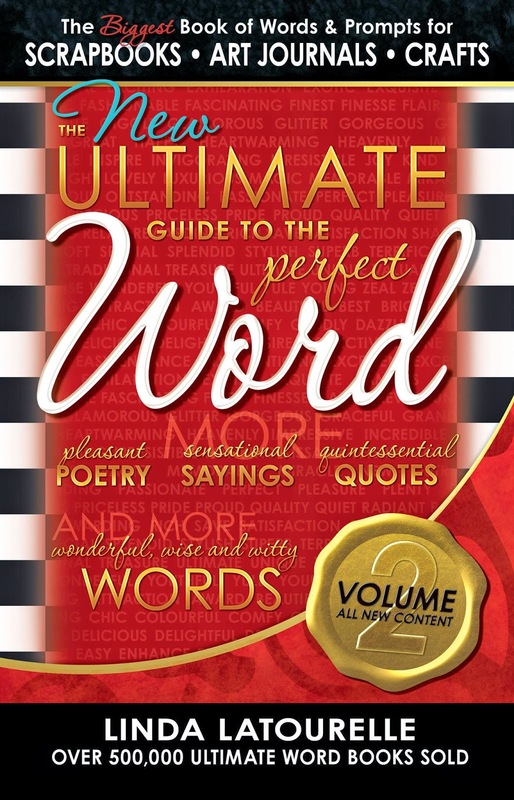 Leave a comment to enter to win a copy of The New Ultimate Guide to the Perfect Word - deadline to enter is April 10th. Good luck! 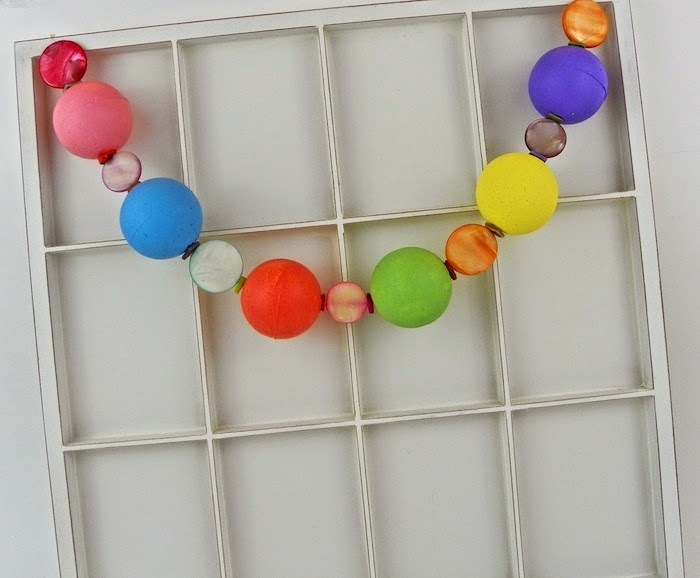 I recently made this cute Easter garland for the Smoothfoam blog with small Smoothfoam balls and some colorful round shell beads. Who says all your Easter and spring décor has to be shaped like eggs? Change the color palette to make this garland for any holiday or special occasion. It's a great way to use up lots of stray beads, too. Click here for the project instructions.